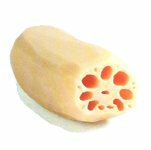 Crunchy, delicate flavored, lotus root is an edible rhizome (root) of the lotus plant. Almost all the parts of the plant: root, young flower stalks, and seeds are being employed in the cuisine. Lotus is a herbaceous perennial aquatic plant belonging to Nelumbonaceae family. Scientific name: Nelumbo nucifera. The rhizome is popular as ren kon (れんこん) in Japan and ǒu (藕) in the mainland China. 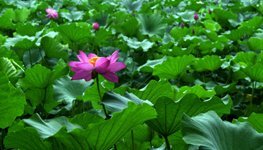 Since centuries, lotus plant and its parts held high esteem in the far East societies, especially in the Chinese and Japanese cultures. Peeled cut section of lotus rhizome (Nelumbo nucifera). Lotus root grew as annual root vegetable crop in the customized ponds. Although it can be raised from seeds, commercially; its rhizomes with meristems (growing points) preferred for plantation, since it takes overall fewer days for crop production. Rhizome formation usually coincides with the appearance of large floating leaves on the surface of the water, about 5-6 months after its plantation. The edible rhizomes grow in the swamp, underwater environments. Lotus root is a modified tuber which stores energy in the form of starch. It develops into sausage-like three to five intersecting nodes measuring about 2-4 feet in length. Each rhizome segment features smooth, gray-white tube measuring about 10-20 cm in length, 3-7 cm in diameter. Internally, the root has white, crunchy flesh with mildly sweet, water-chestnut-like flavor. The cut sections reveal a visually appealing display of symmetrically arranged air canals (holes) traversing all along the length of the root. The lotus fruit is an enlarged receptacle akin to sunflower head wherein numerous edible seeds embedded in its head. Lotus root is one of the moderate calorie root vegetables. 100 g root-stem provides about 74 calories. Nevertheless, it composed of many health benefiting phytonutrients, minerals, and vitamins. Lotus rhizome is an excellent source dietary fiber; 100 g flesh provides 4.9 g or 13% of daily requirement of fiber. Dietary fiber together with slow digesting complex carbohydrates in the lotus root help reduce blood cholesterol, sugar, body weight and constipation conditions. Fresh lotus root is one of the excellent sources of vitamin-C. 100 g root provides 44 mg or 73% of daily recommended values. Vitamin-C is a powerful water soluble antioxidant. It is essential for the collagen synthesis inside the human body. Collagen is the main structural protein inside the body, required for maintaining the integrity of blood vessels, skin, organs, and bones. Regular consumption of foods rich in vitamin-C helps the body protect from scurvy, develop resistance against viral infections, boosting of immunity, wound healing and to scavenge cancer causing harmful free radicals from the body. Further, the root contains moderate levels of some of the valuable B-complex group of vitamins such as pyridoxine (vitamin B-6), folates, niacin, riboflavin, pantothenic acid, and thiamin. Pyridoxine (vitamin B-6) acts as a coenzyme in the neurochemical synthesis in the brain which influences mood. Adequate pyridoxine levels help control nervous irritability, headache, and tension. It also cuts heart attack risk by controlling harmful homocysteine concentrations in the blood. In addition, the root provides healthy amounts of some essential minerals like copper, iron, zinc, magnesium, and manganese. Copper is a cofactor for many vital enzymes, including cytochrome c-oxidase and superoxide dismutase (other minerals function as cofactors for this enzyme are manganese and zinc). Along with iron, it is also required for the production of red blood cells. Crunchy, neutral yet delicate flavor of root lotus is because of its optimum electrolyte balance. It composes agreeable ratio of sodium to potassium at the value 1:4. While sodium gives a sweet taste to the root, potassium counters the adverse effects of sodium by regulating heart rate and blood pressure. Lotus root (renkon) harvest begins by August and lasts until fall. Traditionally, farmers sink their legs in knee-deep ponds and try to feel for the rhizome guiding their toes, which are then dug out by hand. The Southeastern region of China and Lake Kasumigaura in Ibaraki Prefecture in Japan are known for renkon production. From a distance, lotus rhizomes appear as big size bananas arranged in sausage pattern. While buying, look for fresh, firm roots with smooth, unblemished skin. Fresh roots are readily available year-round in the main cities in the USA. One can also buy sliced, canned, and freeze-dried roots in the supermarkets or Japanese and other Asian stores. Lotus root, known as renkon in Japan and Lián ou in Chinese, hold a special place in their cultures. The rhizome as well as lotus seeds; raw or cooked, widely used in a variety of Eastern recipes in the Far East, Southeast Asian, and Pacific regions. To prepare, break the root at nodal intersections into individual parts. Wash it thoroughly in cold running water before use. Trim the ends. Peel its rough outer tough skin using a paring knife to expose ice-white, daikon (radish)-like flesh underneath. It can be cut into cubes, or julienned in ways desired as in other vegetables. Rinse the slices immediately in the vinegar or acidulated (lemon) water to prevent discoloration. Lotus root salad with chili peppers. Young, clean and tender rhizomes can be added raw to salads. However, mature rhizome tastes bitter and can be eatenonly after cooked. 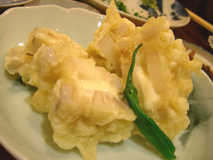 In Japan, renkon is one of the root vegetables used in tempura and kinpira style cooking. Sautée its slices in soy sauce, mirin (rice wine) and chili peppers. Lotus root chips are popular snacks in Japan. The root, popularly known as kamal ki kakari or bhe in India and Bangladesh, features in a variety of curry, stews, and stir fries. Chinese uses the root in soups, stuffing, stir-fries, etc., especially in Cantonese style cooking. In China, lotus seeds are enjoyed as snacks, in soups, in cakes, and condiments. Lotus root may harbor parasites like Fasciolopsis buski, a trematode that commonly infests in aquatic plants like lotus, water caltrop (Trapa natans), Chinese water chestnut (Eleocharis dulcis), etc. The symptoms of infestation may include stomach pain, vomiting, diarrhea, fever, and intestinal obstruction. Thorough washing and cooking under the steam can destroy its larvae. (Medical disclaimer). <<-Read Lotus seeds nutrition facts and Health benefits. <<-Back to Vegetables from Lotus root. Visit here for an impressive list of vegetables with complete illustrations of their nutrition facts and health benefits. Stanford Medicine cancer center information page-Nutrition to reduce cancer risk .